First I removed the back windows. I am glad I did because the window framing was showing signs of rust. I sanded all the metal down so that it would stop the rust and provide a good seal when the windows go back in. For some reason the removal of these windows were more difficult then all the others and in the process I broke one. Luckily I had removed the window from the Emergency Exit door that was removed from the drivers side of the bus before it went to scrap. It should fit perfect. Next we worked on getting the surface ready for another coat of paint. Going around the entire bus we lightly sanded the surface. 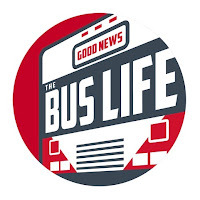 Next we went around and wiped down the bus with a rag and paint thinner. This removed all the sanding dust and gave us a clean smooth surface to paint. 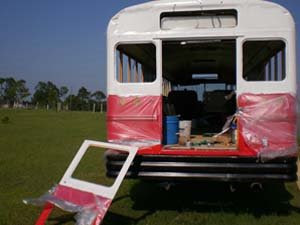 We had not yet put any white paint on the back of the bus so we started there. Next we painted applied another coat to the passenger side. 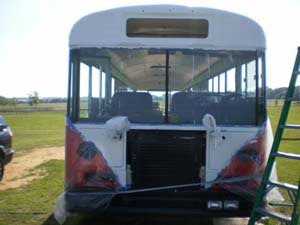 This is the passengers side third coat of paint. 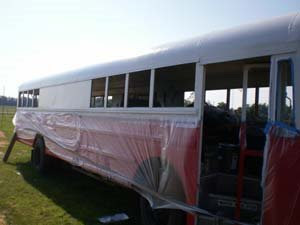 Later in the day we were able to come back and put another coat on the drivers side and the back. Tomorrow (besides some touch up) the paint should be done!!!!!!! !